When I click on ‘Get Rates’ I’m facing an error that states ‘You must select a trackable option for at least one menu item under Service Tracking Preferences’. What should I do? 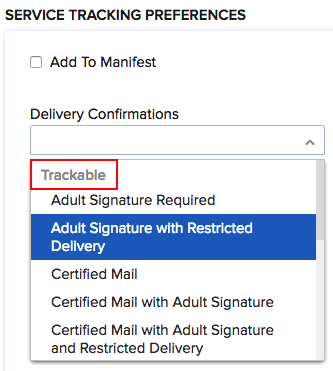 Navigate to the Service Tracking Preferences section on the same page. Click on the dropdown for one of the preferred menu items. Choose a suitable option under the ‘Trackable’ category.